The tour starts at The Old Fire Hall, built in 1855. In 1883 the second floor and hose tower were added and the building was used for this purpose until the 1940s. Now go up to the corner of Gore. 45-49 Gore E. - Conway's and Finnegan's - this was the Brooks block which was erected in 1846. 51-53 Gore E. - in 1850 Mr. Wm. O'Brien had this 2-1/2 storey building erected. 1979 a fire gutted this building and it was restored by Mr. Matthews to what you see now, a replica of the original building. Note the plaques attached here. 57-61 Gore E. - 1841 Francis Holliday had this 2-1/2 storey building erected and from 1852-1912 it was owned by the Sheriff James V. Thompson - this is the reason for the name the Sheriffs House. It has had many changes over the years. 63-67 Gore E. - Thomas Wright Building. 1851 Charles Rice erected this building with two shops and the Bathurst Courier on the second floor. In 1862 the name changed to the Perth Courier and in 1889 they moved to 57 Gore. From 1867 to 1930 the Wright family were furriers in the 63 Gore part of the building. From 1958 to 1972 Jack Thomas, Optometrist, owned the building and the building was restored to its present state in 1997. Thus the reason for the name, Thomas Wright Building. 69-71 Gore E. - This building was erected in the 1850s with many different merchants using the second floor and two shops over the years. 73 Gore E. - This building was erected in 1884 with a wide variety of merchants, from a hardware to a convenience store. 77 Gore E. - In 1907 the Carnegie Library was erected, designed after the Bank of Montreal in Toronto. In January 1980 the building was gutted by fire and in 1982 it was restored by Gordon McMillan and it is now known as the McMillan Building. 81 Gore E. - This building was erected in 1932 to house the Post Office on the ground floor and Canada Customs and caretakers residence on the second floor. The new owners now call this the Crain Building. In 1972 a new government building was erected on the northeast corner of Herriott and Beckwith St.
85-87 Gore E. - This building was erected in the 1860s for a bakeshop and residence. From 1877 to 1941 it was McLaren's Bakery. Since then it has seen many different uses. 91 Gore E. - This two storey brick building was erected in the 1860s by John Doran, an early builder. It was a doctor's office until 1885 and since then has had a wide assortment of tenants. 84-88 Gore E. is a 3-storey building erected in 1846 by William and James Muir, merchants, and has had a wide mix of merchants to the present time. Since 1941 a restaurant on the corner with different owners. 92 Gore E. is a 2-storey building erected in 1874 by John Riddell, a cabinet maker, and has had number of different merchants, with Crawford's being here since 1939. 93-99 Gore E. is a 3-storey building erected in 1850 by John Doran with 3 shops and apartments, and which has had many different occupants over the years. In 1988 the whole building was restored inside with Maximilian's restaurant using the whole ground floor with businesses on the upper floors. Note the Perth Designated plaque. The Tay Canal and start of Haggart's Ditch, again look across the street. 98 Gore E. is a frame 2-storey building erected in 1885 by a barrister for his office, and has had many different occupants over the years, grocers and now a cobbler shop. 100 Gore E. is a stucco covered brick building erected in 1827, and from 1860 to 1911 it was known as the Union Hotel, and has had a wide variety of uses since then. Now turn the corner and proceed down Mill Street. 9 Mill St. - This 1-1/2 storey stone house was erected in 1820 by Capt. John McKay, treasurer. It has had various uses since then, and is reputed to be the oldest stone house in Perth. 13 Mill St. - Erected in 1863 and first the home of a tailor, then a painter, and now a private dwelling. It is designated as a Heritage home. You now pass the swimming pool built in the early 1930s with Stewart Park on your right. 41 Mill St. - The Haggart House, erected in 1837 by John Haggart, who was a Scottish stone mason. This Regency style house was once the home of the Hon. John C. Haggart, MP. Note the plaque inside the stonewall. In 1850 a 2-storey building was erected for a flouring mill and a new dam was built to supply water power. Parts of the original mill foundation are still visible along the river's edge. At the end of the street is the Rainbow Bridge, offering easy access to the portion of Perth called Carolina Village. There is a plaque here. Now head back down Mill Street until you come to Stewart Park, which was developed in the early 30s by the Stewart family, owners of the land. In 1947 Mrs. John A. Stewart presented the park to the Town of Perth in memory of her late husband, a turn of the century industrialist, lawyer and former Mayor of Perth. He was the last owner of the McLaren Distillery that was founded by Robert McLaren in 1831, the plant was famous for "Old Perth Malt" a Scotch whiskey that incorporated wood in the malt, rather than the peat commonly used in Scotland and Ireland. You now are near the area of the rear of the Town Hall, called the Market Square, which was used as a farmers' market to which as late as the early 1930s, produce and animals were brought for sale. In the 1930s the Band Stand was erected. 10 Market Square. This house was erected in 1856, a plank on plank 2-storey home, the residence of Robert Gemmill, a distiller whose business was across the road where part of the park now is. Since 1983 this house has been a law office. 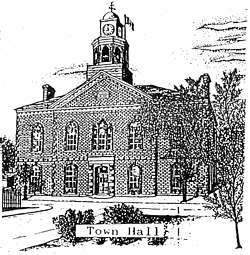 Town Hall - erected in 1863 from locally quarried Potsdam sandstone. This Neo Classical structure once housed a concert hall as well as municipal offices. It was the home of the Perth Chamber of Commerce, Police and Fire Departments, which are now in different locations. The Perth Citizens' Band formed in 1885 is still located here. The Band Stand was erected in the 1930s and during the summer months is used for bi-weekly band concerts. The clock was installed in the tower in 1874. Across the street is the Basin area, which in the late 1800s was a busy area with commercial and passenger boats. The Crystal Palace was erected by the Perth Theatre Project as part of a planned development, which did not materialize. The material for this building came from the Rideau Street Mall of Ottawa and the names of some of the merchants are still visible. 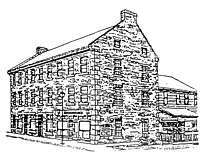 25 Drummond St. E. - This is the site where in 1828 a stone building was erected along the river to be used as a distillery and in 1834 the Bathurst Courier was born here. It has been a private residence since the 1840s with many changes to the original building. 23 Drummond St. E. - From 1850-70 this was the office of W.O. Buell, Barrister and Insurance Agent. It has been a private residence ever since. 19-21 Drummond St. E. - In 1856 the house was moved here from the site of Harts Book Store on Gore St. From 1859-67 it was a dentist's office and has been a private residence since then. 15 Drummond E. - This stone house was erected in 1845. It is known as the McPherson house, after McPherson, a mill owner, and has been a private residence all these years. 10 Drummond E. - The Bothwell House, erected in 1863. Bothwell was a carpenter. The building has always been a private residence. 8 Drummond E. - Erected in the 1860s - used as an office for W. Radenhurst, a local Barrister, and since 1870 it has been a private residence. 3 Drummond E. - Erected in 1836 by the Rev. Wm. Bell, being the second house built by him on this lot. The Rev. Bell was the first Presbyterian Minister in Perth. The house was used by his son until 1900 and has been a private residence ever since with many different tenants. 27 Foster and corner of Drummond - A stone building erected in 1858 and until 1868 the home of the Commercial Bank of Canada. The name was changed to Merchants Bank of Canada, who were here until 1912 when they moved to a new location. The building has been apartments and offices ever since. 1 Drummond St. W. St. - Andrew's Presbyterian Church, erected 1928 replacing the old church destroyed by fire 1923, on the comer of Drummond and Craig Streets, which is now the site of the bowling green. This is a designated building. You can now return to the business area. More details information can be found in the book, "The Merchants, Professionals and Tradespeople of Perth," available at the Museum and some other selected merchants.